Three weeks, three years, or thirty years? I am often asked what is an acceptable amount of time to wait before making quilts and cushions from my deceased loved ones clothes. The answer is when ever the time is right for you, I have made quilts three weeks after a death and up to thirty years. They were all very special and all very right for that individual person. I can only say that everyone who has gone ahead with the decision has never regretted it, as it brings a sense of positive achievement when positive times are sadly lacking. I have been told it provides a sense of closure for some people and that when the quilts and cushions are displayed around the home it gives relatives and friends an easy way to start to remember and chat about good times as in “I remember when he wore this shirt to our party where we had great fun” this won’t happen when the shirt is stored away, or hanging in a cupboard. Below is Jackie’s four quilts and two cushions that have been made thirty years after her husbands passing. There is a quilt for each of her adult children and two cushions for herself. 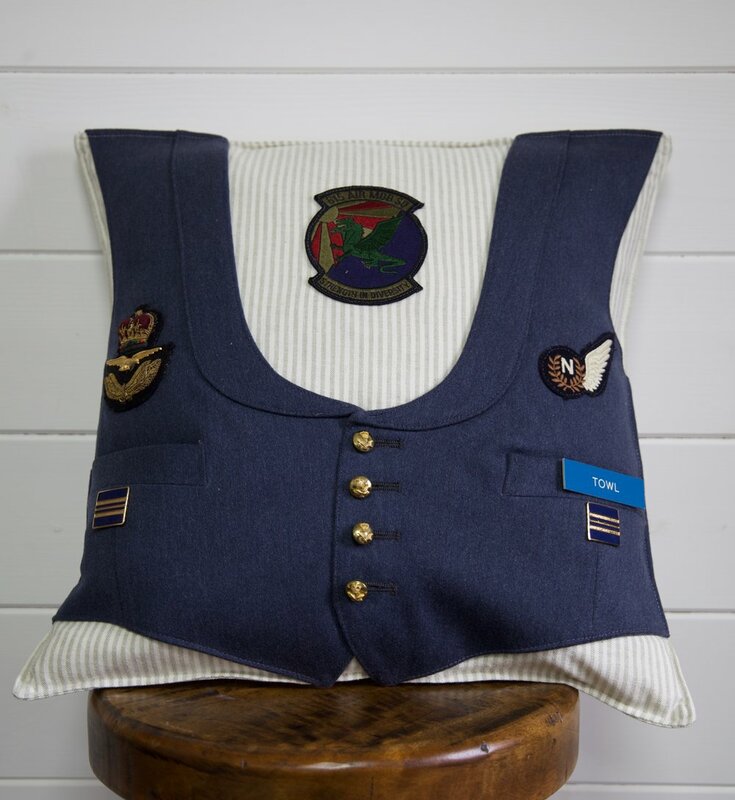 Jackie received her commissioned items quite recently, the text that first came through on my phone read, “Karen the parcel has arrived, I have seen the cushions which are fantastic, I cannot open the quilts until I recover. 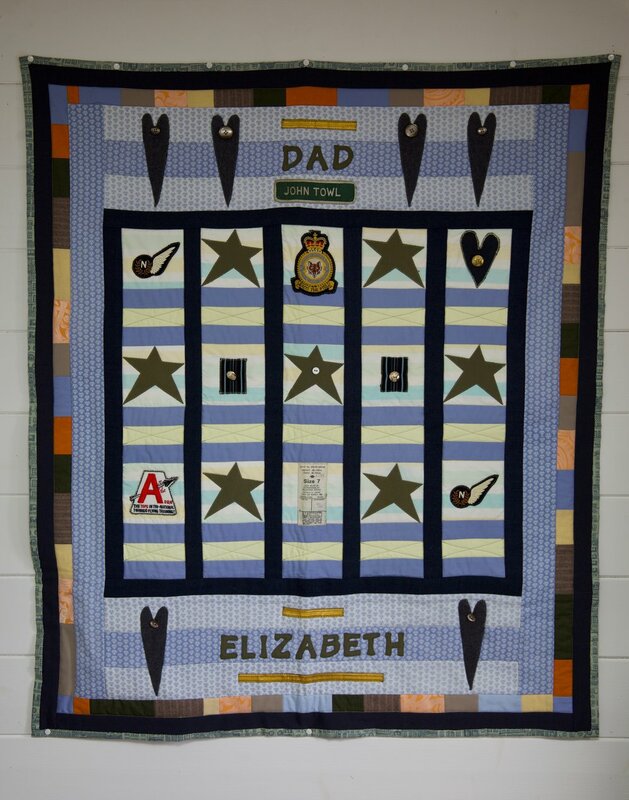 Shortly followed by the second text, Karen the quilts are really beautiful, a true memory quilt for each of my children to keep and pass on. I have been looking at the individual pieces and remembering what they were and when used or worn. The tears have subsided now. I will be taking many photographs before I part with them. Thank you is not enough for the treasures you have created for us.”. So you see Three weeks, Three months, or Thirty years is all the right thing to do. 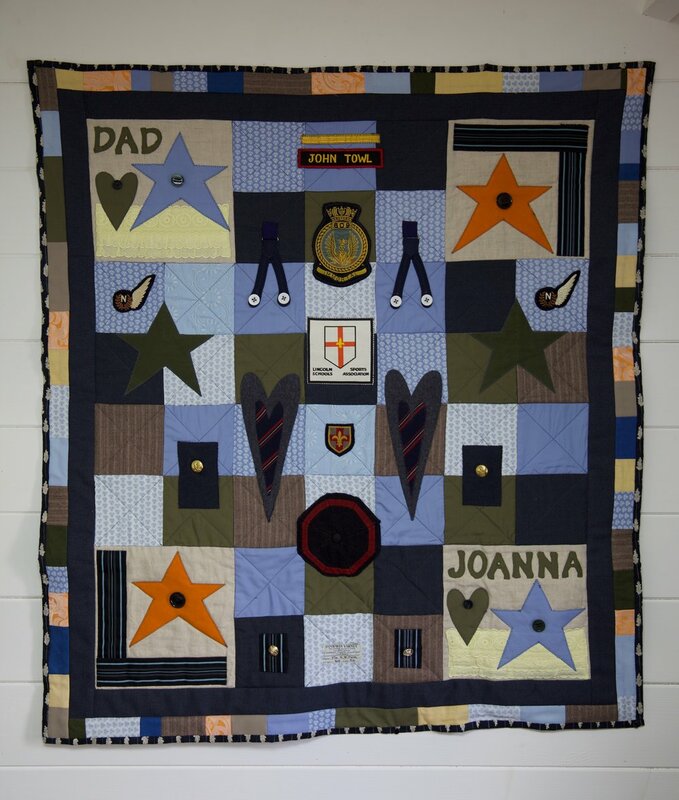 Here are Jackies quilts and cushions full of memories for all four children, clothes from their dad’s RAF life and home life with a few of their own memories added.